Kristy Bolsinger | There’s Social In My Soda! There’s Social In My Soda! @CocaCola reached out and said a “competitive” hello to @pepsi. Not only did they say hello, but @CocaCola actually followed @Pepsi. An article, written by the instigator Iain McDonald (@eunmac) got the attention of people on Twitter and the move by CocaCola was broadcast out by the readers. This is where I got involved. I followed the link to this post from Twitter and subsequently got involved in a conversation with Mack Collier about the two companies as well as the Dr Pepper brand. So at this point, Coke has engaged Pepsi, and I have engaged Coke, Pepsi and Dr. Pepper. Cause that’s what we do in social media. We socialize. Even with our brands! These two extremely competitive brands are both socializing with their customers, but they’re also socializing with each other. Will this trigger a change to how brands view their competition in the social media space? Only time will tell. This could end up being a catalystic event, or simply an interesting little moment in the Coke v Pepsi saga. But it does lead us to considering what value/consequences/benefit could come from inter-brand socializing in social media. Also, let the record show that @Pepsi is now also following @CocaCola on Twitter. That’s some hot brand lovin’ right there! Let us also, now look at how each of these brands engaged back with me after having mentioned each of them (utilizing their Twitter account name so I’d be sure they caught it) several times. So there you have it. @adamcb is the man behind the curtain. What did @DrPepper do? They followed me. Did they interact? Nope. An auto-follow perhaps based on the usage of their username? Quite possible. I tweeted about this post and what should happen? @DrPepper was very quick to respond in an awesome way! Kudo’s guys!! Did you see when I told @gloriabell that Dr Pepper should sponsor our blogs since we loved Dr P? 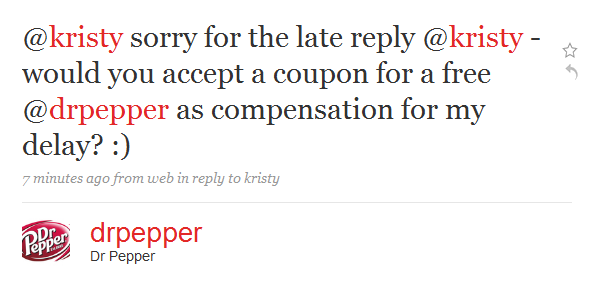 @drpepper later replied to both of us telling us to DM them details Which I did! A cool day for Twitter n sodas! Oh wow! That’s awesome!!! I didn’t see that…Good for them!! Cause in all truthiness I have to admit it’s a dead tie between Diet Coke and Diet Dr. Pepper for me! Glad to see they stepped up in a really great way! Kristy, I agree. Diet Coke and Diet Dr. Pepper ( incl Cherry) are my faves, too. Yet while online interaction is fun, I don’t think my beverage preferences would change based solely on the existence of interaction or not. Either way, great post. I think brand preferences might not ‘change’ but I believe that loyalty is affected which alters a persons loyalty. Loyalty is a critical factor in purchasing behavior. Only time will truly tell what effect online interaction through social media will have on consumer buying habits/patterns. Great post, Kristy! I had fun following your “social soda adventures” today. I think it’s a great idea for competing brands to chat each other up in social networks. It shows goodwill, injects personality into the brand, and in some cases, displays a real commitment to customer service, especially when the brands cover different geographical regions or caters slightly different demographics. I was really happy to see @ZalesDiamondGal on Twitter on June 15, 2009, and genuinely wanted to engage ( http://twitter.com/BenBridgeGirl/status/2188028460 ) but didn’t hear back. After tweeting about the @cocacola and @pepsi story today, I tried getting the attention of @ZalesDiamondGal and @bluenilediamond again. I’m happy to report that @ZalesDiamondGal responded: http://twitter.com/ZalesDiamondGal/status/2426489168 (7/1/09). Perhaps industries or brands that are new to social media are unsure of how to proceed, and want to take time to observe competitors’ actions. It is completely understandable. But hey, someone needs to reach out first. @cocacola did, as did @BenBridgeGirl. Hopefully, the trend will catch on! check out http://twitter.com/redbull we are humbled to have close to 10,000 followers and are actively involved in the twittersphere with our fans! coke and pepsi making peace is interesting I guess…but in my clearly biased opinion, what’s going on in the world of Red Bull is the most interesting stuff happening for a beverage brand on twitter. @BenBridgeGirl I am in love with how you reached out to those other brands. I’m really intrigued by this inter-brand socializing. I think there are definitely a lot of opportunities for brands to learn from each other. There’s something to be said for just sayin’ it like it is: “I am new here. I want to learn from you.” How’s that for authenticity! Good on you! Thanks to both for stopping by! @kdoohan Maybe this is nitpicky, but something about the fact that you left nearly identical comments (minus of course the added commentary) here as you did on AdAge (http://adage.com/digitalnext/article?article_id=137709) Doesn’t sit right with me. Copy and paste, in my mind, isn’t an ideal method of blog commenting. Then it starts to look a “bit” like trolling. So, I wonder, are you targeting all blog posts on this subject to leave your c + p message? Ummm, wow. I need to get back on twitter more apparently. Have I mentioned my two favorite sodas ever are Coke Zero and Dr. Pepper?? Hmm, to go along with Coke’s commercial’s I wonder if Coke Zero will have a different twitter account? I would if I were them while the commercials were running. I saw the conversation happening here and at AdAge. Hats off to you for jumping on it and participating. Posted similar comments in both places because I thought if I didn’t, I’d be missing out on the opportunity to share Red Bull’s success and to learn from the ongoing conversation at both threads. Hope you understand. It’s not meant to be a spamming thing at all. If you’d like to discuss offline, DM me your contact info at @kdoohan. BTW, I commented on the AdAge article but didn’t post the response here. Not making the same mistake twice. 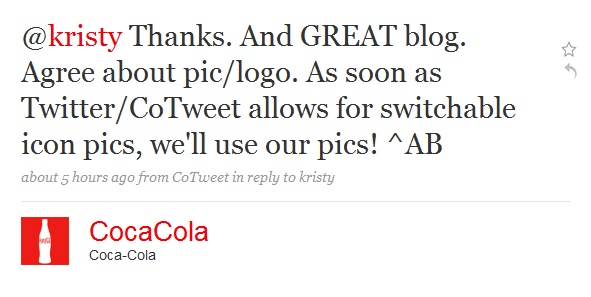 Two of the most popular soda brands are twittering…and exchanging hellos! @kdoohan I can certainly understand the desire to jump in and share! Thanks for responding, it’s appreciated greatly! One line I loved in this post “we socialize with our brands, thats social media” – pure gold. I’m gonna have a good think about that!